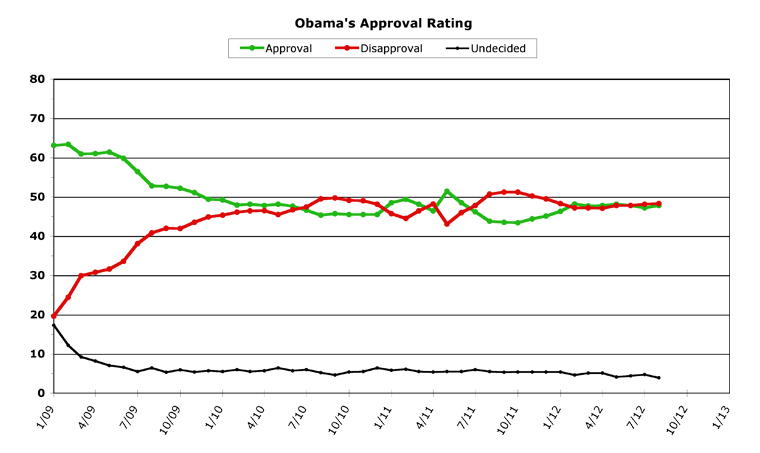 This is going to be the shortest Obama Poll Watch column of all time. I am in the midst of packing and running around getting ready to travel to the Democratic National Convention. I will be flying all of tomorrow. So you're getting your OPW column early this month. There simply wasn't any other time to fit it in. There will indeed be a column Monday, and it'll be somewhat of a surprise for convention week, so I encourage everyone to tune in as usual on Labor Day. 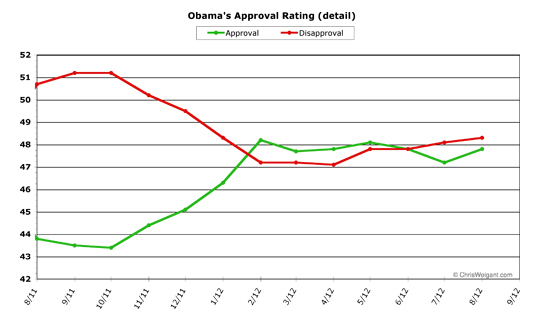 Obama's average monthly job approval rating gained 0.6 percent this month, to finish up at 47.8 percent. 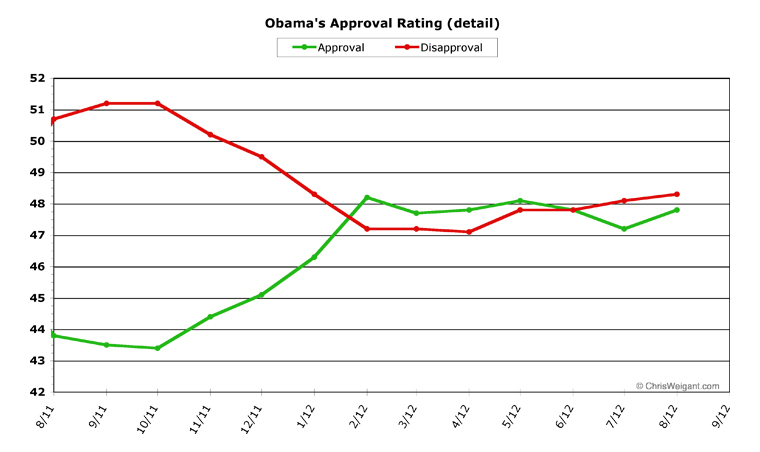 His job disapproval rating slightly ticked up 0.2 points, to close at 48.3 percent. 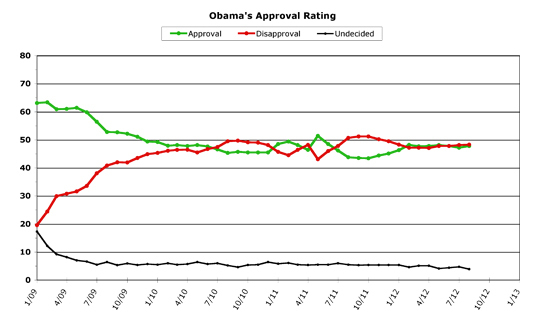 This leaves Obama a half a point underwater in the polls -- better than last month's 0.9 percent down. Of note this month is how closely this election season is tracking George W. Bush in 2004. 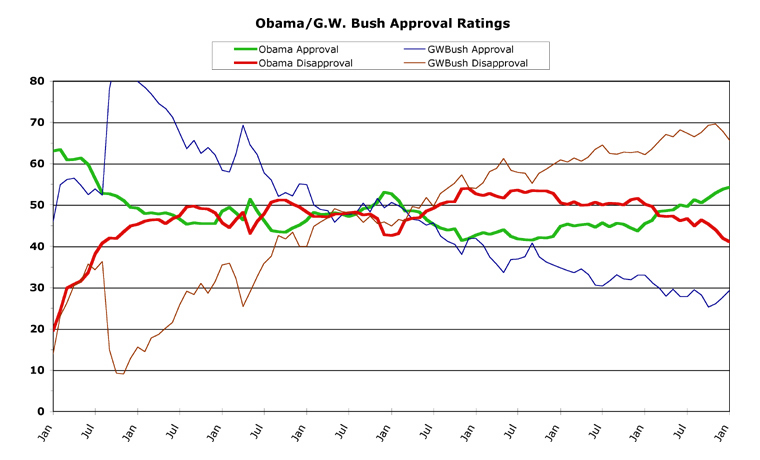 Check out the Obama/Bush comparison chart to see how their numbers were almost exactly the same at this point in their first terms. Also of note is the extremely low undecided number -- now down to 3.9 percent, lower than it has been for his entire term. It's election season, folks! Obama decisively reversed the trend downwards from last month in his approval, but his disapproval continued upwards on the same slope as last month. This was possible since more undecideds made up their mind. OK, sorry, but that's all I've got time for. Join us tomorrow as our convention coverage begins! Bon voyage, safe journey and have lots of fun in Charlotte! It'll be nice to have you in the Eastern time zone for a change. Heh. Yeah, maybe I won't have to get up at 4:00AM to get interviewed! Check back tomorrow, there's a cool auto-post column that should be up by noon Pacific time, and everyone will want to read it... if something goes wrong with the auto-post, I'll fix it by midnight East Coast time, I promise, so keep checking back. "If I can't turn this economy around in 3 years, I don't *DESERVE* another term." The economy was turned around in LESS than three years! Much less, in fact. Granted, we still have a ways to go to get back to where we started from (that is to say right about the end of the Clinton admnistration) but we are on the right track with no desire to go backwards now. Yea... And last summer was the "Summer Of Recovery".... Or was that the summer before??? You ask ANY average American if they feel the economy has "turned around". I doubt you would find ONE who would say that the economy has turned around..
How much was gas when Obama took office?? $1.95 a gallon..
To look at a map searching for Democrats of the future though, is to be reminded of a painful truth for the party gathering in Charlotte: President Obama is their undisputed leader, but the Obama presidency has been a time of deep Democratic decline. CNN is a standard water-carrier for Obama. How else does one explain the Great Democrat Shellacking of 2010??? Oh Sorry... I forgot that everyone here LOVES facts..
Democrats had 257 seats in the House when Obama took office. That number has shrunk down to 190 plus 3 Dem vacancies waiting to be filled..
and how did this turn of events come to pass? Republicans saw how Democrats behaved when they had complete unchallenged and unequivocal control of the government.. They reasoned, correctly in MNSHO, that *these* Democrats simply cannot be trusted to run the government.. So, they decided that, WHATEVER it took, they were going to make sure that these Democrats could not be in a position to cause any more damage to this country.. Anyone wanna talk about this new Documentary that is making a HUGE splash?? If the Leftest of the Left Steven Spielberg calls it fair and truthful, then it's definitely a movie to see.. Someone here posted that Democrats don't lie as much as Republicans..
"...Fifty-two percent of likely voters say the nation is in “worse condition” now than in September 2008, while 54 percent say Obama does not deserve reelection based solely on his job performance...."
Gee, that's roughly the percentage of voters who voted O into office. I'm smelling a bit of buyer's remorse. Excellent OpEd piece on why Israel cannot expect ANY help from Obama AFTER the election..
Democrats are poised to avoid the danger of President Barack Obama accepting his party’s nomination before a partially-empty stadium by shifting his speech to an indoor arena and citing ‘severe weather’. The Obama campaign have been working desperately to ensure that the 74,000-seater Bank of America stadium in Charlotte would be filled. Buses for students from across North Carolina and even members of black churches in neighboring South Carolina have been arranged. Images of rows of empty seats at the stadium, home of the Carolina Panthers, as Obama speaks on Thursday night would be politically disastrous – an enduring image of the contrast between his campaign of ‘hope’ and ‘change’ in 2008 and his dour, negative struggle for re-election in 2012. Now, it looks like the weather has come to the President's rescue. If they're worse, it's going to underscore the futility of keeping Democrats in office..
And that STILL didn't fill up the stadium... They had to move the venue for the speech that had 40,000+ less seats so as not to make Obama look like an idiot..
Democrats know how to throw a party!!! As much as it pains me to say, Netanyahu and Israel don't owe a damn thing to the Obama Administration..
Wow Michale so much nonsense I don't even know where to begin. Maybe you could try and stick to the point of the main blog post just a little bit? So far you've got the economy, 2010 elections, Israel, the convention, unemployment and more in your list of rants. Calm down! Sorry if you can't keep up, Michty..
Haha I'll wait until you realise you are basically talking to yourself! Such rapid fire information, while common in my former profession, is kind of hard for civilians to keep up with..
Well I was more interested in debating and discussing things - posting a string of right-wing rhetoric on many different topics, that most people are just simply ignoring, doesn't really accomplish much! Yea, ask the Jewish people here in America if they are "simply ignoring" this issue?? Just out of interest since you've actually settled on 1 topic, I thought you didn't like religion Michale? You think basing a foreign policy entirely on religion is a good thing? You think what the Middle-East needs is MORE US interference? Or are you just arguing this because you don't like Obama? My admiration and support of Israel has absolutely NOTHING to do with religion and EVERYTHING to do with the respect I feel for Israelis, especially their military. I have been deployed to Israel on many occasions and have always been honored and privileged to work with the best of the best. I have nothing to do with, nor nothing in common with the Jewish people, as far as their religion goes.. It has absolutely NOTHING to do with religion or politics.. And everything to do with honor and a debt that is owed..
You're gonna have to give me a freakin' break on that one, my friend. What on earth do you really mean by that, anyway?